Want your students to become active, creative risk takers? We develop active, creative, risk takers! 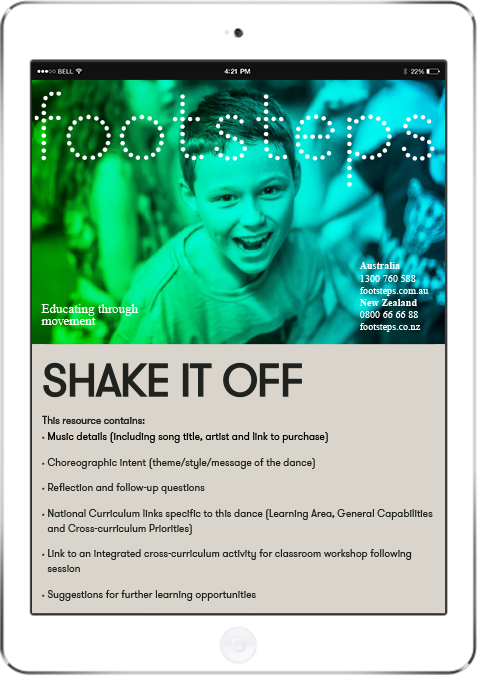 Footsteps specialises in curriculum, age-based movement programs for Foundation to Year 12 students. We deliver engaging and relevant dance and drama programs which have been developed around the Australian National Curriculum. Our programs develop students’ social skills, confidence, fitness levels, creativity, expressive skills and coordination, ensuring we provide a safe, positive and stimulating environment for all students! Teacher resources have been developed for every lesson as a part of our commitment to supporting educators in their planning and assessment. Quality outcomes to our programs include discos, formals, parent presentations and school concerts, giving students the opportunity to display and share their Footsteps experience. DANCE + DRAMA = ACTIVE, CREATIVE, RISK TAKERS! So how can Footsteps develop active, creative, risk takers? We specialise in curriculum compliant school dance programs where dance is used as a vehicle to develop students’ social skills, confidence and creativity. Students will experience various dance styles including hip hop, funk, modern pop, contemporary, partner and various multicultural dances from around the world. Students learn to dance both individually and with a partner, promoting social interaction and confidence building, as well as improved fitness, coordinating and gross motor skills. Our dance program has been developed around the Australian National Curriculum and include both individual and partner dances, indigenous inspired routines and opportunities for student choreography in our term long programs. We thrive on supporting teachers with learning outcomes for their students. Our programs are not only exciting and fun for students but sustainable for teachers from dance floor to classroom. Our Drama Program engages students through purposeful and creative structured activities based on improvisational drama. Students will explore and experience the role of both artist and audience. We encourage students to become aware of situations as they listen and respond as fictional characters. During a program, students will build on their skills, assisting in their ability to develop an understanding of a character. Fun and innovative activities will develop improvisation skills and encourage students to explore their voice and movement to create role-play. Our drama program is curriculum compliant and students’ learning outcomes will be achieved using voice, movement, social skills and fun activities. Your course will include assessment and lesson documentation to ensure we are meeting all your drama curriculum requirements. It's been the best thing we have ever done for our kids! I love joining in with the kids. I have nearly perfected doing the moonwalk too!.. I have no hesitation in recommending this program to any school that wants children to experience the fun and excitement of dance that is well suited to primary aged children. Fiona and Stephen have handled our large groups very well during lessons. They have an excellent rapport with our students and have encouraged participation with their enthusiasm. Our students, staff and whole school community found Footsteps to be experienced, energetic and their enjoyment of dance was contagious. They have been a great asset to our school and I would highly recommend them to any school! We have used Footsteps at our school for a number of years to improve the learning outcomes across all curriculums. Teachers particularly find the web resources really helpful to support their learning planner. Teacher Resources at your fingertips! Start using our teacher resources today! Turn your students into active, creative risk takers!